Sonoma County Winegrowers (SCW) is excited to announce our 2017/2018 Commissioners, including the return of seven incumbents, as well as the election of three new members. The organization’s Board of Directors represents some of Sonoma County’s top vineyard properties, families and AVAs, as well as leaders in the local community and wine industry. Incumbents who were re-confirmed as commissioners include: Joe Dutton of Dutton Ranch, Doug McIlroy of Rodney Strong Vineyards and Aquarius Ranch, and Glenn Proctor of Puccioni Vineyard and Ciatti Company; newly re-elected as commissioners include Vickie Mulas of Alta Vista Vineyard and Mulas Farming, and Marissa Ledbetter-Foster of Vino Farms. Re-elected as alternate members include Domenic J. Carinalli Jr. of Carinalli Vineyards and D&L Carinalli Vineyards, and Brent Young of Jordan Vineyard & Winery. Newly elected alternates include Tony Bugica of Atlas Vineyard Management/Walala Vineyard, LLC, Taylor Serres of Serres Ranch and Robert Weinstock of Gallo Vineyards Inc.
During the July Board meeting, the Commission unanimously elected Joe Dutton as Chairman of the Board, Glenn Proctor as Vice Chairman and Mark Sanchietti as Treasurer. 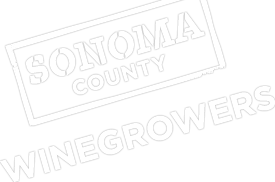 The 2017/2018 Sonoma County Winegrowers Commissioners include: Joe Dutton (Chairman), Glenn Proctor (Vice Chairman), Mark Sanchietti (Treasurer), John Balletto, Marissa Ledbetter, Doug McIlroy, George Martinelli, Vickie Mulas, Bret Munselle, Steve Sangiacomo and Ray Johnson (Public Member at Large). The 2017/2018 Commission Alternates include: Tony Bugica, Domenic Carinalli, Anna Darden, Mark Pasternak, Brad Petersen, Dan Rotlisberger, Rich Schaefers, Taylor Serres, Robert Weinstock, Brent Young and Rhonda Smith (Public Member at Large).